Do you live in Homosassa? In 1851, David Levy Yulee established a 5,000-acre (20 km2) sugar plantation on the Homosassa River, close to the current town of Homosassa. The plantation was worked by approximately 1,000 slaves, but Yulee was an absentee owner, spending most of his time in Fernandina. Among the crops raised were sugar cane, cotton and citrus. The Yulee Groves were one of the first in Florida to grow sweet oranges budded from sour orange stock. The mill, which was steam-driven, operated from 1851 to 1864 and produced sugar, syrup and molasses, the last of which was part of the rum-making process. After the Civil War ended in 1865, Yulee was imprisoned, the slaves were freed and the site was abandoned. The remains of the plantation are preserved at the Yulee Sugar Mill Ruins Historic State Park. 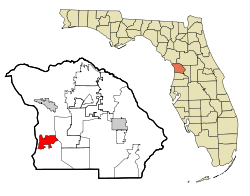 Homosassa is located in southwestern Citrus County, to the west of U.S. Routes 19 and 98 (Suncoast Boulevard). The CDP extends west on both sides of the Homosassa River to a network of marshes and islands that lead to the Gulf of Mexico. The original settlement of Homosassa is located on the south side of the Homosassa River, 3 miles (5 km) west of Homosassa Springs by either West Fishbowl Drive or West Yulee Drive. According to the United States Census Bureau, the CDP has a total area of 8.3 square miles (21.5 km2), of which 7.8 square miles (20.1 km2) is land and 0.54 square miles (1.4 km2), or 6.30%, is water.